By Luciano Manna, translated by Alessia Melchiorre – The production chain of Taranto’s mussels is affected by illegal activities, committed along the years and still today, which represent a high health risk for the consumers as they place on the regular market, both local and international (fish shops, restaurants, fish markets), noxious mussels grown by breaking the law. 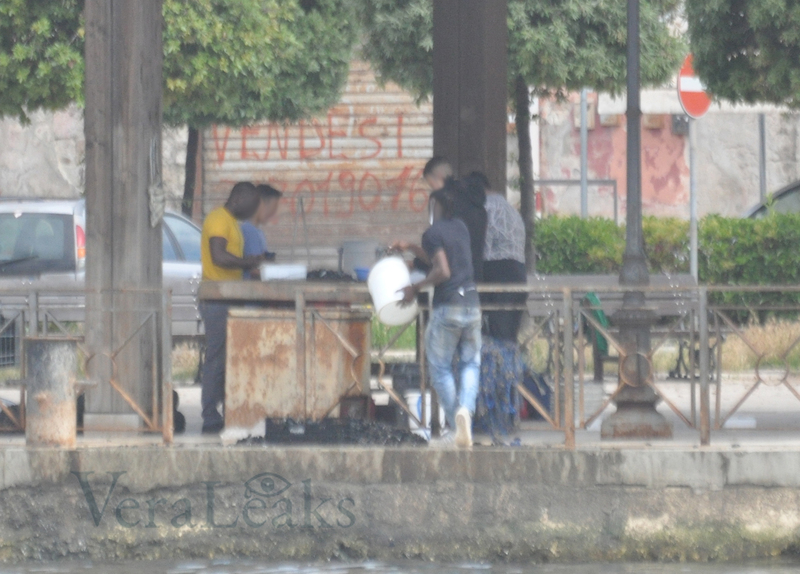 In order to buy safe and uncontaminated mussels it is not enough to avoid the unauthorised stands at the corner of the streets or on the sidewalks, as it was often suggested by the local institutions, such as Taranto’s local health authority ASL. The noxious mussels, contaminated by dioxin and PCB, for years reached the consumers’ tables and keep on reaching them still today, even through authorised retailers. 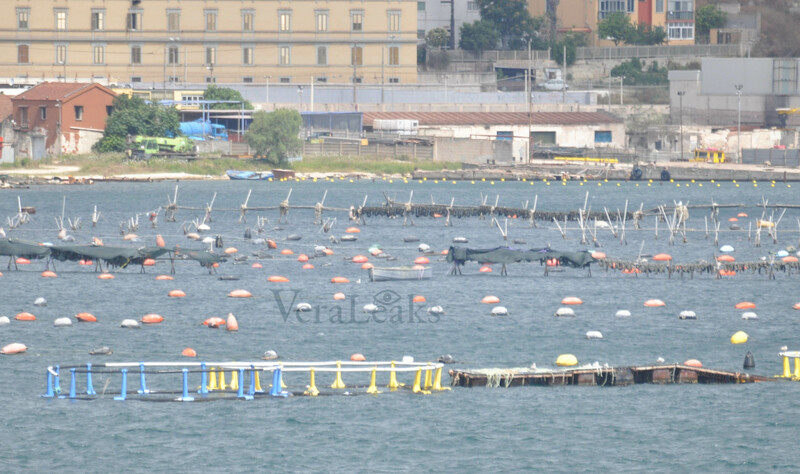 23 maggio 2018, il primo seno del Mar Piccolo di taranto pieno di cozze in fase di sciorinatura in violazione dell’ordinanza regionale. What follows has the only purpose of protecting the fishing industry of Taranto and whoever worked and still works today according to the law and to the rules. Unfortunately nowadays whoever follows the rules in Taranto, the mussels growers or simply the workers in the industry, is disadvanteged by an illegal system that since 2011, the year when for the first time the high levels of dioxin and PCB were found in the mussels, has totally been “authorised” by an institutional “modus operandi” that in fact legalised it. The illegal system of Taranto’s mussels can’t be dismantled today simply because it represents the 50% of the annual turnover of the entire fishing industry. 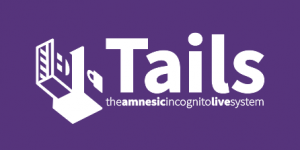 Consequently, if it was blocked immediately it could bring on their knees many entrepreneurs and families that make a living on this illegal system and so they let this considerably risky food arrive on the consumers’ tables; a food which resulted, in the ASL’s analyses, contaminated and dangerous for the human health. Also those who operate in the illegal system are victims of the same system. The institution is not able to put the people in condition of working in a legal system that produces a healthy and controlled food. 24 maggio 2018, un mitilicoltore appronta le cozze in fase di sciorinatura in violazione dell’ordinanza regionale. 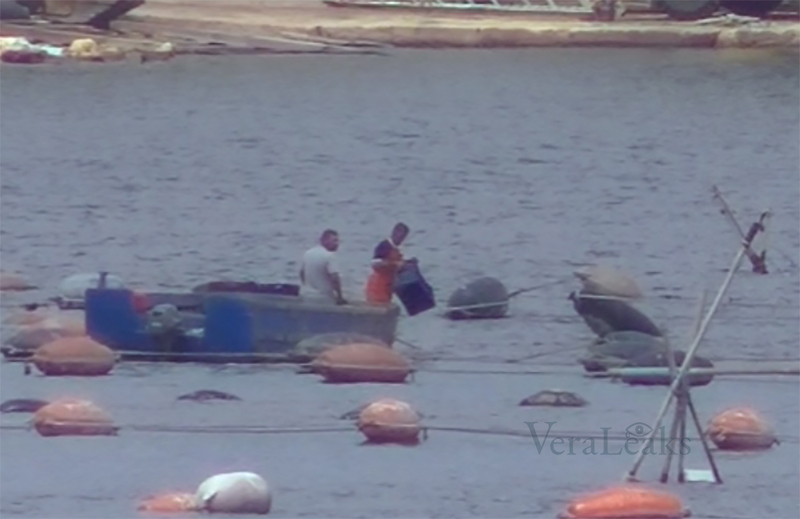 24th of May 2018, a mussel grower prepares the mussels on display phase in violation of the regional decree. But this is not happening and all of this is ridiculous and unacceptable if we think that the risky and contaminated mussels are only those grown in the first inlet of the Little Sea. The others, those grown in the second inlet and in the Big Sea are not contaminated, they are safe, or at least this is what results from the ASL’analyses. Unfortunately, a remarkable quantity of mussels from the first inlet, produced during the year, is regularly introduced in the authorised business market. Moreover, the product of the first inlet, despite the laws forbiding it, represents an important production of mussels for the economy since the product of the second inlet was lost in August 2017 due to the high temperatures of the waters in an exceptional summer heat. 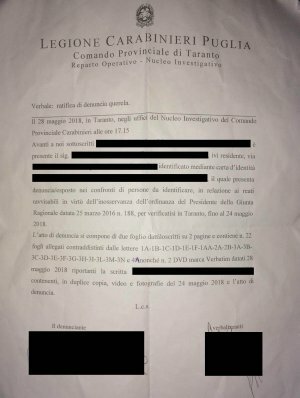 In the early hours of the 7th june 2018 the Italian Police Carabinieri and the military members of the Coast Guard of Taranto carried an operation in the first inlet of the Little Sea in Taranto, following which one tonne of black mussels were confiscated and 8 people faced charges for “production, detention and sale of noxious mussels illegaly grown in the first inlet of the Little Sea”. The proof that these noxious mussels end in the authorised retailers network is also given by the fact that one of the 8 reported people was a retailer from the province of Taranto who had bought 60 kilos in order to sell them in his own business. Certainly this is not the first time that retailers from the province are stopped while buying noxious mussels from the illegal market. These noxious mussels are sold by the unauthorised growers to the retailer for half the price (approximately 40 euro cents per kg) because they come from illegal mussel cultivations in the polluted waters of the first inlet of the Little Sea in Taranto. This operation was commented, by common people and institutional bodies, as a result of security checks on the production chain of the mussels. False. Feeling safe because there were the security checks was a general belief. False. The military operation did not happen because who was supposed to check did the job. If everyone did their job, there wouldn’t have been thousands of tonnes of black mussels in the first inlet of the Little Sea last May, when the municipality decree prohibited the presence after the 31st of March. 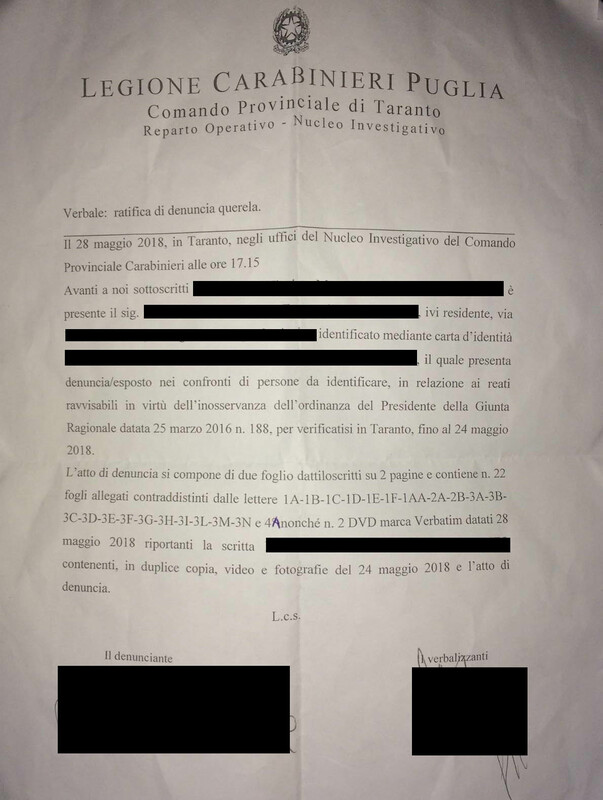 The military operation of the 7th June was made possible thanks to the report of a citizen of Taranto on the 28th of May, in the offices of the Investigative Unit of the Italian police Carabinieri of Taranto. A detail specified also in the public statement of the Italian police, where it says “following the highlighting that reached the Carabinieri of Taranto about the attested and illegal cultivation and withdrawal, from the first inlet of the Little Sea, of adult mussels ready for sale and consumption, even after 31st of March, day within which, according to the regional decree, the mussels must be collected at their status of “seed” to be implanted again in uncontaminated waters”. On the 7th of November 2017, in the offices of the Provincial Unit – Operational Department – Investigative Team – Carabinieri, the data of the analyses of the ASL of Taranto, concerning the years 2015, 2016 and 2017, were deposited. More specifically, those from the 2017 attested, in the months of May, June and July, values beyond legal limits, in some cases even more than the double value beyond the legal limits. They are cultivated without registration according to the law CE n. 852/2004. In May, the activities conducted in the first inlet of the Little Sea resulted contradictory and unrespectful of the decree of the President of the Regional Council 25th March 2016, n.188. 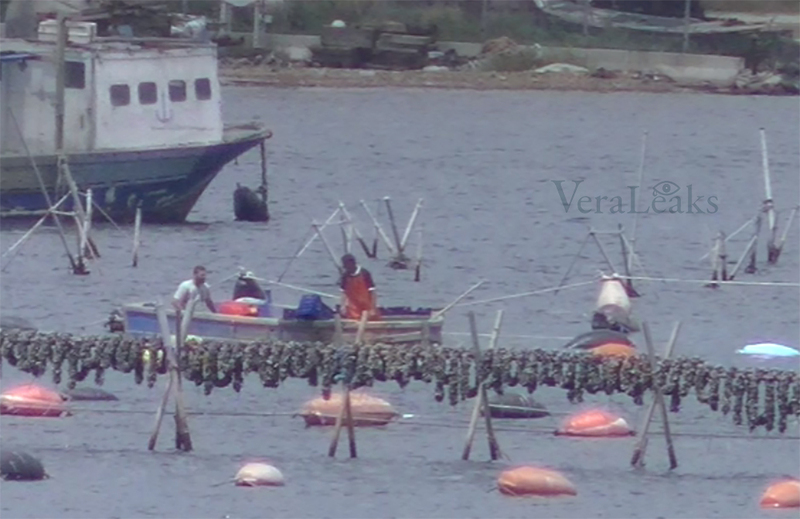 On the 24th of May, photographs and videos were deposited in the report to the police; the photo and video material records the presence of mussel cultivation activities in the first inlet of the Little Sea, mussels (black mussels, cockles, clams) are cultivated against the above-mentioned regional law. 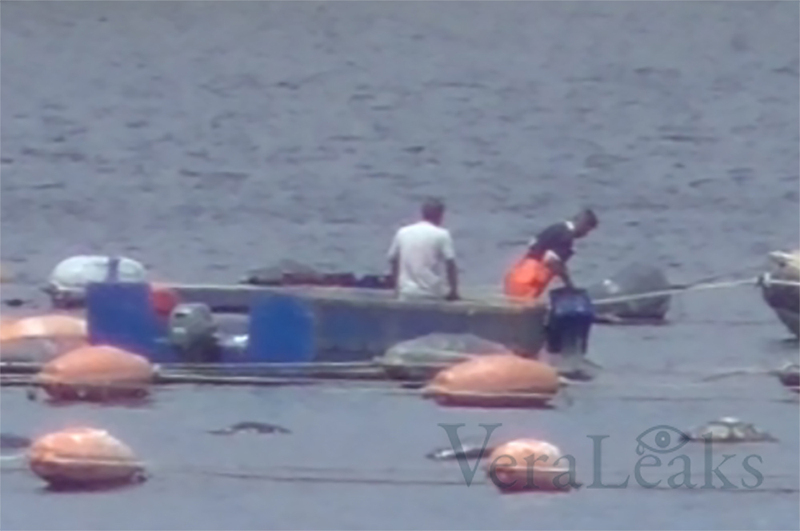 Moreover, it is evident in the pictures and videos that, at least until the 24th of May 2018, the whole first inlet is affected by operations of “sciorinatura” (displaying) in the mussel cultivations. 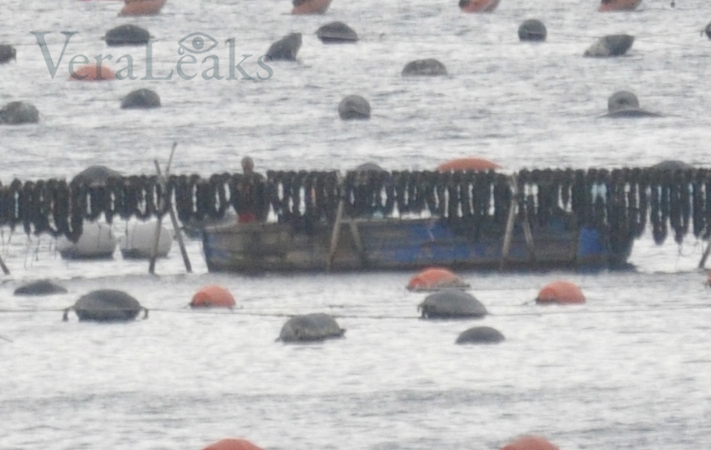 The “sciorinatura” is the final phase that the adult mussels have to undergo before being sold on the market. 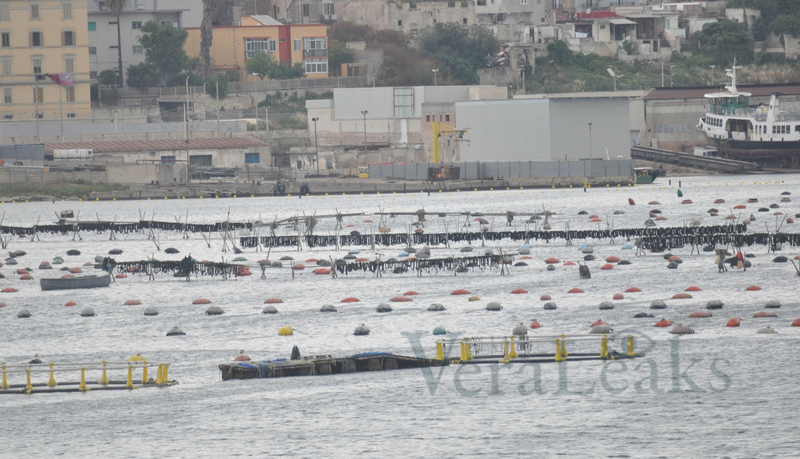 The picture shows the poles of the cultivations in the first inlet of Little Sea with the mussels on display phase. The pictures show also other mussel growers who, from the bottom of the first inlet of the Little Sea, through specific moorings placed in advance, carry on boat many blue trunks and then transport the product in some stores around the area of the city called “Porta Napoli” (these trunks contain mussels as well as cockles and clams). 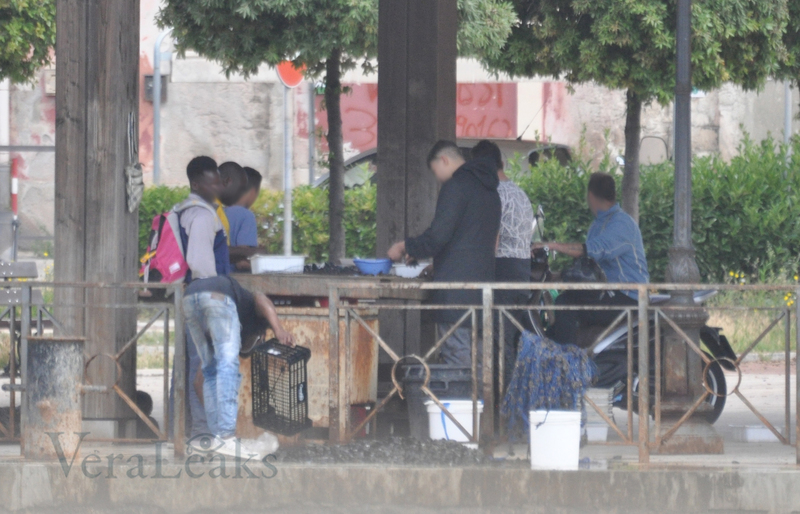 These images show activities of cleaning and opening of the mussels in the area Piazzale Democrate, where apparently the health restrictions are violated and where several people are employed among which, as it is evident in the pictures, also minors and migrants. All the media material was produced on the 24th of May 2018. 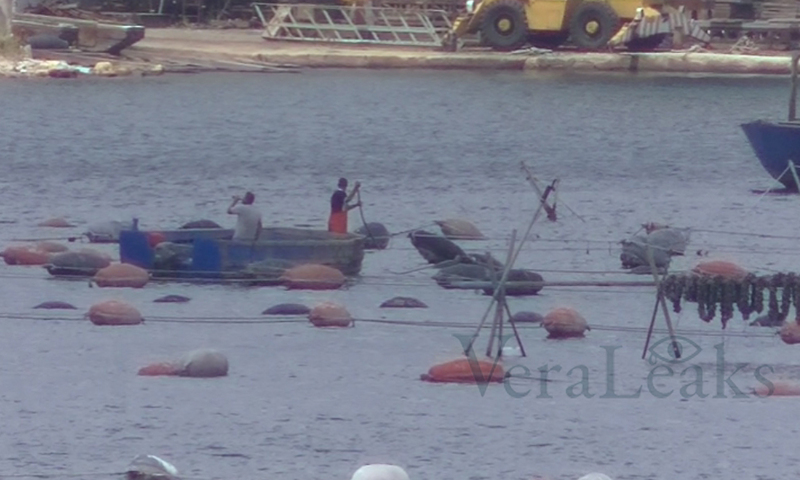 In the months of March, April and May 2018, at least 3 companies (whose names were given to the police) which operate in the mussel cultivation sector and are linked to the people portrayed in the videos and photos, have operated by collecting the product from the first inlet of Little Sea to put it on the regular and authorised market, both local and international market; in some cases they labeled the product as cultivated in other areas: Big Sea, San Vito. The entire product (black mussels, cockles and clams) is weekly loaded on big vehicles addressed to the international market (EU countries) and on trucks for the supply of the local and provincial market. It is important to point out that the supply and sale of the mussels to the local retailers, after the labeling with areas that are different from their source of cultivation, that is the first inlet of the Little Sea, do not happen only around the unauthorised stands on the city sidewalks, but they are sold directly to the authorised retailers, such as restaurants, fish shops or markets. With regard to the information concerning the production chain of mussels in Taranto, it has been requested in April 2018 the update of the data on the mussels cultivated in Taranto. The update refers to the time frame August 2017 until the most recent months of 2018. In the same request via PEC (Certified e-mail) it is inquired about the quantities and the analyses concerning the mussels moved and not moved according to the Regional Decree 25th March 2016, n.188. So far, no reply received. 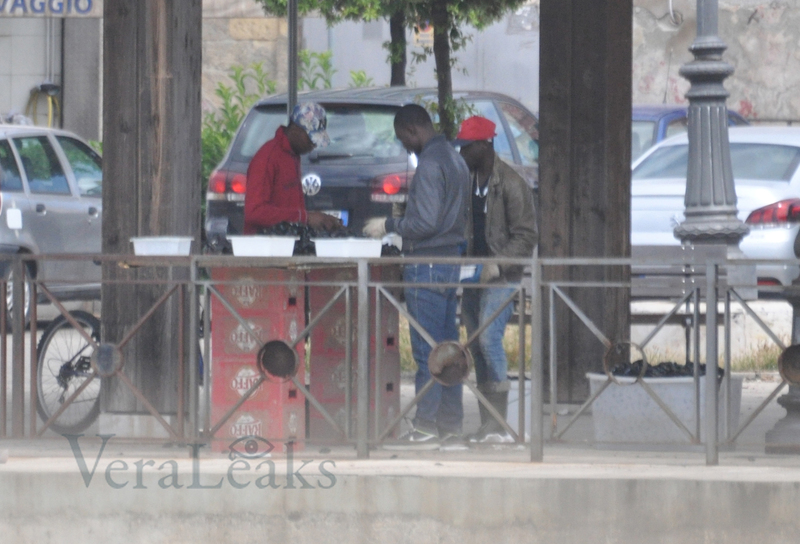 What was reported to the Carabinieri of Taranto proves wrong what the Director of the Department of Prevention of the Asl in Taranto, Mr. Michele Conversano, and the public statement by Confcommercio (General Federation of Italian Commerce and Tourism) declared about the operation of the 7th June. 24 maggio 2918, mitilicotori prelevano mitili dalle acque del mar piccolo in violazione dell’ordinanza regionale. 24th May 2018, mussel growers take the mussels from the waters of the Little Sea in violation of the regional decree. Also Confcommercio Taranto is of the same advice and puts in the headline of its public statement: “The mussel cultivation of Taranto is safe”. What follows is their declaration: “Confcommercio Taranto and its operators in the mussel cultivation sector that are part of the association, express appreciation for the operations of monitoring the sector of the mussel cultivation aimed at revealing the unregulated avtivity, although it is necessary to point out that the phenomenon affects only a part of the entire production, only “pieces of activity” that work on their own and with no rules. It is really regretful to see that because of few subjects, unrelated to the sector, the consequences have to fall on the entire production questioning the quality and the healthiness of the mussel of Taranto and the efforts that – in cooperation with the scientific institutions – to restart the sector. The seizures of illegal product unfortunately increase the sensationalism that discredits the regular producers two times”. These communications are not consistent with the facts and contradict what reported to the Carabinieri on the 28th of May. Every year the first inlet of the Little Sea of Taranto puts on the market approximately 5 thousands of tonnes of mussels that produce a revenue of hundreds of thousands of euros. In the operation of the 7th of June, only one tonne of mussels was confiscated. After the operation, in the same stretch of water, in the first inlet of the Little Sea, around 1000/2000 tonnes of mussels are left out. 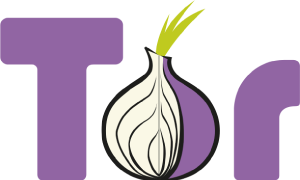 All the illegal operations continued the day after the 7th of June. 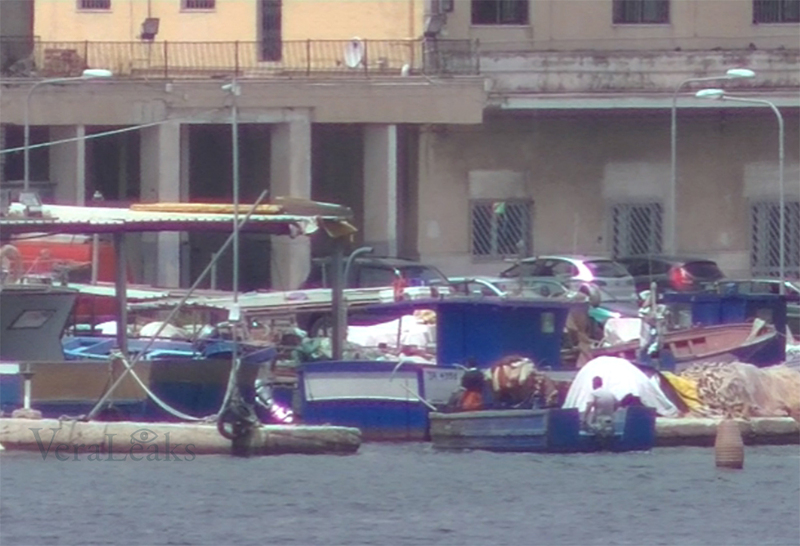 Moreover, the illegal market in the city of Taranto is fostered by the mussels coming from the market of the lakes in Sibari and labelled as mussels grown in Taranto. Also these, without checks in the cultivations and therefore remarkably risky, are placed on the regular market by unscrupulous authorised retailers of Taranto. 24 maggio 2018 operazioni di pulizia dei mitili abusiva presso Piazzale Democrate. 24th of May 2018, operations of unauthorised cleaning of the mussels in Piazzale Democrate. The noxious mussels, contaminated by dioxin and PCB, enter the regular market since 2011. At the time, in the first year when they had to go the shredder, they completely vanished, as claimed by marshal Massimo Giuliano, in service to the Coast Guard of Taranto, answering the questions of the public prosecutors during the hearing of the trial “Ambiente svenduto” (Sold out environment) last June 2017. We talk about 20 thousands of tonnes of mussels, whose only 141 tonnes were destroyed because of contamination. Since 2011 nothing has changed, the first inlet of the Little Sea continued to produce, not only against the regulation of the ASL itself, but also with operators, not all of them but most of them, that did not have any authorisation and still nowadays do not hold the licence to operate in the production and commercial sector. Not only the regulations are not followed, but those who operate in the mussel cultivation do not have the licence to operate. Also the Special Commissioner for the decontamination of Taranto, Ms. Vera Corbelli, who attended the Council assembly at Palazzo di Città on the 1st of December 2017, communicated the numbers related to the unregulated activities in the fishing industry of Taranto: “There are few funds concerning the brand of the fishing activities but not so many, we are connecting with the Ministry of Agriculture and the European Community, but in order to get the brand the fishermen need to get the licence, there are 1500 operators in the Little Sea that grow the mussels and sell them, only 80 of them have the licence and that is all. I went to talk at the Ministry’s and they told me: “Where do we start from? Who has the licence, only 80 people? Do the others stick to the rules?”. How do the ASL and Confcommercio claim that the market is monitored where there is a system almost completely uncontrolled? How do they think that thousands of tonnes of mussels were cleared out only through the unauthorised stands on the sidewalks of the city? How do they claim that the mussel from Taranto is supervised and safe if this one is cultivated by 1420 operators without licence and 80 authorised ones, considering that some of these authorised ones label, and therefore certify that the mussels were grown in safe waters but actually come from the first inlet of the Little Sea? How do ASL and Confcommercio support the theory “everything is fine” when since last May and still nowadays, despite the seizure in June, there are tonnes of mussels from the first inlet when this stretch of water should have been empty by the 31st of March? Still today, after the seizure and the operation of the 7th of June, there are mussels from the cultivations of the first inlet. Game over. Today this game down and remarkably risky on people’s health is over. There is no need of encouraging proclamations and public statements or “ad hoc” reports on TV to give the semblance of safety. What was reported to the police proves that the system of supervision is failing and that the noxious mussels are introduced on the regular market and arrive on the consumers’ tables. How many people got sick or will get sick because of the mussels contamitated by the dioxin and the PCB? Who is responsible for this? Today we have proof that this illegal system was highly underrated so that the system could work under everyone’s eyes. Why those illegal mussels from the first inlet were reported by a citizen and not by the institutions that were supposed to supervise and intervene? 23 giugno 2018, il primo seno del Mar Piccolo di Taranto ancora interessato da migliaia di tonnellate di cozze, alcune delle quali in fase di sciorinatura, in violazione dell’ordinanza regionale. 23rd of June 2018, the first inlet of the Little Sea of Taranto still affected by thousands of tonnes of mussels, still in display phase, in violation of the regional decree and after the seizure of the 7th of June led by the Italian police Carabinieri. These claims contributed to put at risk also those who reported and have been called “alarmist” in some public statements. Whoever works in the illegal fishing sector, probably feeling authorised or justified by those official statements, already tried to intimidate those who, only few months ago, reported the illegal system and activated the Italian police in regard of these threats. If these people will start to take action against those who want the law to be respected, who will share the responsability with them? After the operation led by the Carabinieri and the Coast Guard, the only ones who have reacted to the charges by the citizens in the name of a forgotten law, there are risky mussels in the first inlet of the Little Sea, ready to be sold still today. The health of the citizens is at risk. May God forgive you because the victims of this system maybe won’t have the time to do it. The charges will follow. 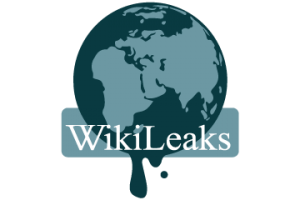 This complicit game was unmasked and we hope it will end soon.